I am behind again. I have been traveling almost non-stop the last several days, and haven’t had a lot of opportunities to publish to the blog. On Day 12, I took the train from Edinburgh to Cardiff, Wales. It was a very long trip, and by the time I arrived, I was quite exhausted. I spent the evening reading about Sandemanians in Wales. Christmas Evans was a one-eyed Baptist minister who served the poor congregants throughout Wales for 49 years. For about 10 of those years, Christmas Evans was a Sandemanian. He was converted to the Sandemanians on the Island of Anglesey off the coast of Wales, where he had been assigned to minister to all of the Baptists on the island. He and many other Baptists became Sandemanians, in part, it seems, in defense of their strict Calvinist beliefs. When Methodists arrived on the island, Evans attacked them, attempting to defend Calvinist soteriology against Wesleyan Arminianism. Evans became one of the most well known free church ministers in the history of Wales non-conformity. Day 13 was my birthday. I spent it touring the Cardiff area, visiting the Cardiff Castle, and enjoying this beautiful city. Later in the day, I took the train to London, and promptly went to bed. Day 14 I spent in London, discovering the city. London is the place where the most famous of Sandemanians, Michael Faraday, was a member. 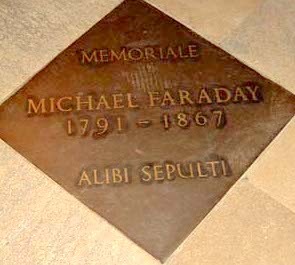 Faraday was an important enough person in the social and political circles in London that he has his own memorial in Westminster Abbey. However, because of his supposedly unorthodox Sandemanian beliefs, he was denied burial in the Abbey and was instead buried in the Highgate Cemetery in London. I did not have time to visit Highgate on this day, but I hope to do so before I leave the UK. Knows of the fast-shut grained oak door. Oh Highbury Station once and again. That the LORD OF THE SCRIPTURES IS LORD OF ALL. Old Sandemanians are hidden from the sun.